Summer can be the cruelest season for landscape photography. Early sunrises and late sunsets don’t fit comfortably into the modern pattern of life. Sunrise before 5.00am often means rising at 2.00am to be in position on a Pennine hill top to catch the first colours of dawn. Sometimes it can be an exhilarating experience to spend a summer night on the moors waiting for dawn, but it isn’t something that can be done regularly if you have to function like a normal human being and do a day job, resisting the overwhelming urge to fall asleep during the afternoon. 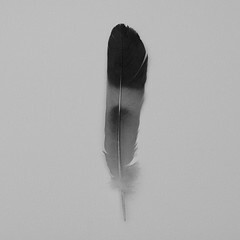 It isn’t unusual for me to deviate a little from my normal approach to landscape photography during the summer months. Often I will use the long daylight hours to visit historical buildings, or scout out new locations. Last year I enjoyed photographing new fern fronds unfolding in our garden, lavender buds bursting into life and butterflies visiting the buddleia. Often a summer project will present itself to me naturally. This year, springtime had been unusually busy. With a general election approaching I had been frantically producing materials for my local (newly formed) Green party. Once the election was over, my thoughts began to turn back to routing around in the history around me. A walk around the monuments at nearby Wentworth Castle presented me with a new project, but not one that I had expected. I can see Wentworth Castle from the end of the road that I live on. A wooded hilltop across the valley that has been occupied since at least the Iron Age, now crowned with an 18th century castellated folly. A little further down the slope stands Wentworth Castle, a huge country pile sat on the hillside in all its Georgian splendour. For more about the history of Wentworth Castle, see my earlier post. While researching this, I decided that I needed to have a proper walk around the parkland and explore the monuments. I parked near the Strafford Arms, walked through Strafford Gate and up the hill to the restored Serpentine Bridge. Following the path along the Serpentine (originally an ornamental river, but now a series of half dried-up ponds) I eventually reached the small patch of woodland, heading for the Rotunda. As I emerged from the woods, there in the field before me was a couple of Fallow Bucks, with Red Deer further down the hill. I was of course immediately smitten! I made a return trip with my camera with the intention of photographing the Serpentine Bridge and Rotunda, it didn’t take much for my attention to turn towards the deer and my summer project was born. I returned to Wentworth Castle Park almost every day over the summer. Sometimes walking the dogs, sometimes with my camera but always watching the deer as closely as possible, getting to know their habits and just how closely they would tolerate me. While the fawns were still young, the does were quite jumpy. They would bark their dismay when I drew close and an early lesson in respecting distance was learned when a red doe charged at one of my dogs. Fortunately, there was a big wire fence between us but it demonstrated that these are not just docile, passive animals. They should be respected and given space. There has been a deer park at Wentworth Castle/Stainborough since at least the Elizabethan era and two species of deer inhabit the park. 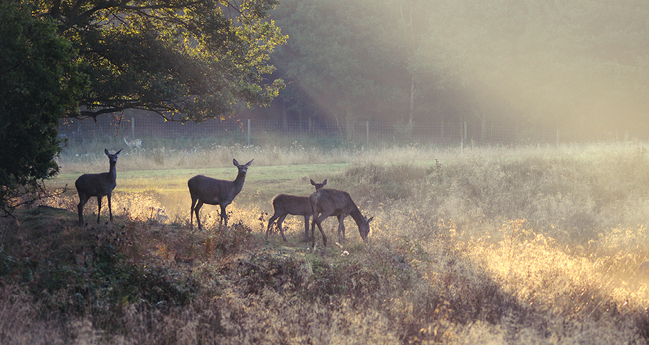 Red deer, which are farmed at Round Green nearby and smaller Fallow deer, which seem to live a more-or-less wild existence. 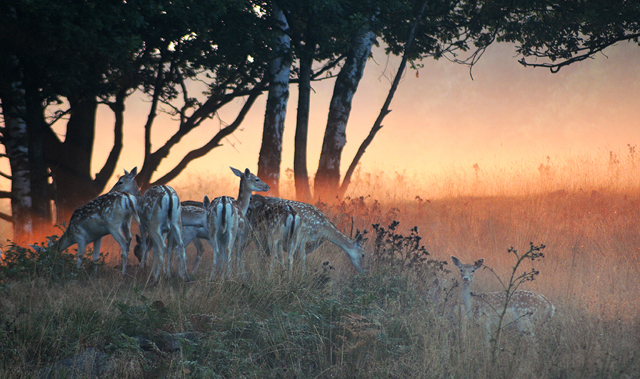 Red deer seem to abide by a herd mentality where as the Fallow deer seem more likely to wander in small groups or individually and are more flighty. 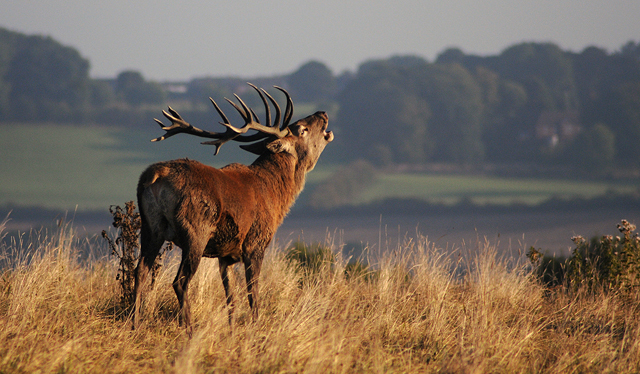 Once you get too close for comfort, they will spring away with a bounding grace, where Red deer will just ease out of your way. I gradually learned how to get closer. I realised quite early on that trying to sneak up unseen was pointless. Dozens of super-sensitive eyes, ears and noses will know you are there before you even see the herd. I found that giving them time to get used to my presence, while gradually moving forward diagonally produced the best results. Eventually, I found that I could almost walk amongst the herd, although respecting a certain distance is still important and by using a long lens, I don’t need to get too close anyway. 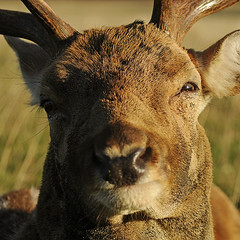 There are only so many close-up head-shots that are useful and I prefer to try to capture the deer in their environment. I feel that the wellbeing of the animals is by far more important than getting photos and after a while (usually no more than an hour) I withdraw and let them get on with doing whatever deer do when humans aren’t around. As summer turned towards autumn, the foals grew bigger and the does became less jumpy. 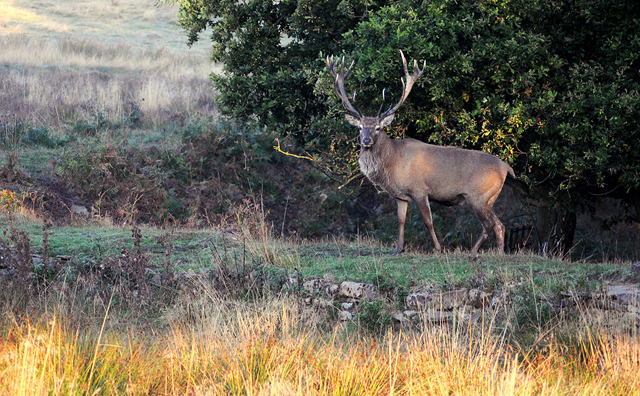 The stags began to joust as rutting season approached and were becoming too distracted to worry much about me. I was starting to recognise individual animals by this time and have to confess a certain fondness for the biggest stag of the herd, a monarch stag who I nicknamed ‘The Big Feller’. He is an impressive creature with huge antlers and when he throws his head back and lets out his baleful bellow, it makes the hairs on the back of my neck stand up. 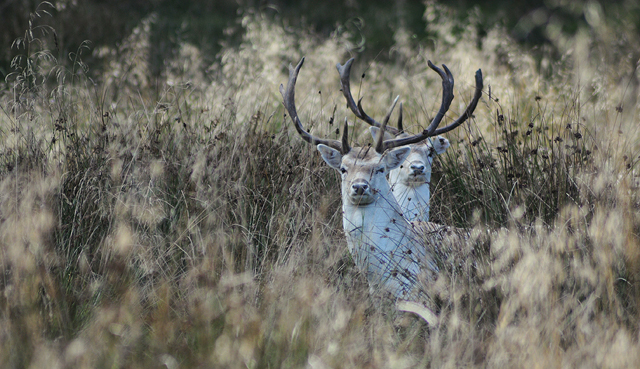 Getting close to Fallow deer is a different proposition to the reds and often turns out to be more by luck than judgement. I found that I was more likely to bump into them than follow them, as they favour the areas of mixed woodland and long grass. The bucks seem to be more relaxed than the does and will tolerate you more closely. There are a couple of bigger bucks that once they were in rutting season didn’t seem bothered by human presence in the slightest. In fact they have passed within a few feet of me without concern. One occasion left me almost speechless. While photographing a couple of bucks in long grass the large white buck announced himself by crashing through the undergrowth. He and the other large buck began ‘parallel trotting’ (a way to size each other up before fighting) towards me before locking antlers with a ferocity that belies their cute appearance. These animals are 200lbs of pure muscle with antlers attached to the front, that bear a close resemblance to medieval weaponry. They were so close that at one point I had to jump out of the way! It was an exhilarating experience. 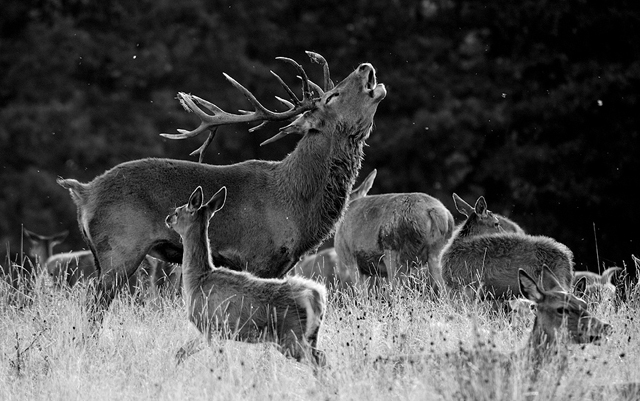 There is something about deer, stags in particular that strikes a deep chord within me. During the Mesolithic period, the image of the stag was scratched into cave walls (such as Creswell Crags) to influence the success of the hunt through ritual magic. The image of the shaman is of a human form bearing antlers. During the Neolithic and Bronze Age periods, stags’ antlers were modified into picks that dug the great ditches around Avebury and many of our other Pre-Roman monuments. 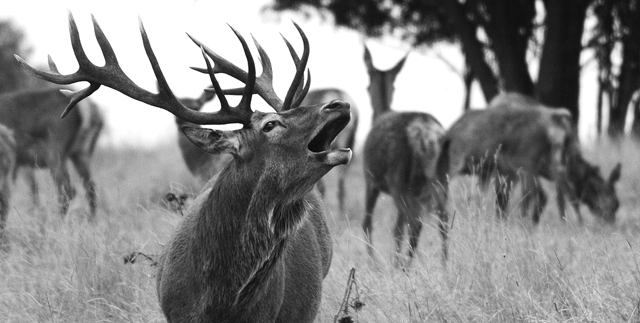 From the Celtic horned god Cernunnos to Edward Landseer’s painting, ‘The Monarch of the Glen’, the image of the stag has been a potent symbol, embedded in our folklore for millennia after millennia. It maybe that the stag represents the spirit of nature, purity and freedom. Dwellers of the green forest, survivors of a primeval past before humans held the ascendency over nature. 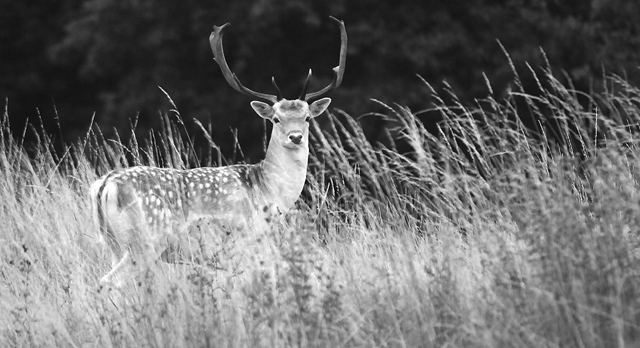 Even after spending most of the summer around the deer at Wentworth Castle Park, I still feel a deep pang when rounding a corner and coming face to face with a stag, or hearing his bellow nearby. 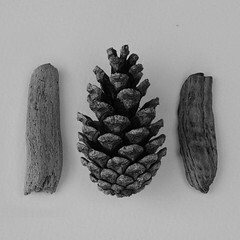 That sense of wonder has not left me with familiarity. I’m looking forward to following the rutting season throughout the autumn and hope that I’ll have plenty more images to share here in the coming weeks. When I first moved to Barnsley in 2004, I was keen to discover the history of the area that I was moving to. A quick search on the brilliant megalithic.co.uk website lead me to an entry on Pastscape detailing that an Iron Age Hillfort had occupied the very hilltop on which I live in Worsbrough Common. Although this was exciting, searches on the ground soon confirmed that nothing seemed to remain. Unlike the nearby hilltop at Stainborough, which still bears the ditches of its hillfort, Worsbrough Common has a large council estate built in the 1950s. 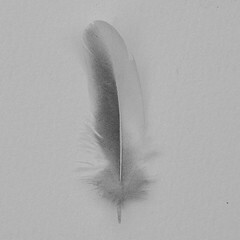 It is likely that this swept away any traces that might have remained. The highest point of Worsbrough Common is still tantalisingly marked as ‘Castle Hill’ on OS maps. At first I thought that this might be the only trace of the hillfort that remained, but I was to find out that it came by its name for a different reason. Although it seems that the hillfort is probably lost, Worsbrough has a fascinating history that has largely been preserved by the good fortune of being located on the edge of Barnsley. During my research into the hillfort, I came across an ancient tome ‘Worsbrough: Its Historical Associations and Rural Attractions’ by Joseph Wilkinson, published in 1872. 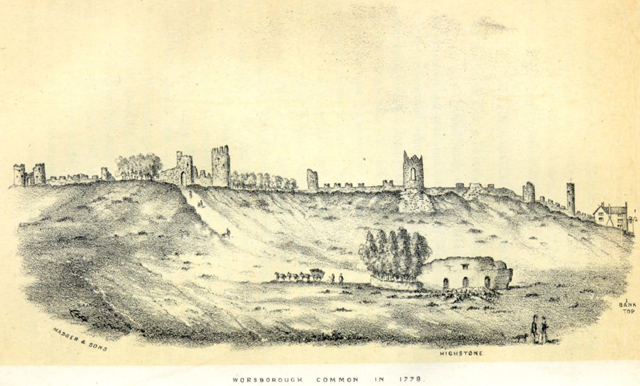 Among its illustrations is an etching plate, dating from 1779 of Worsbrough Common (below) which piqued my interest. Joseph Wilkinson, Worsbrough: Its Historical Associations and Rural Attractions. The etching depicts a view across Worsbrough Common, with the Highstone (Black Rock) in the foreground and the hilltop horizon dominated by a line of castellations and towers. Although the drawing doesn’t accurately match the topography of the landscape, the drawing could have been made from memory and a certain amount of artistic license allowed, the track could correspond to the current position of Mount Vernon Road, which would place the castellations on the skyline running from Kingwell Lane, past what is now Mount Vernon Hospital, towards Black Rock and Castle Hill. As the area is now heavily built over, I considered that all trace of the castellations would now be lost. Especially as the towers have not been included on the OS map of the area, from the 1850 edition onwards, but were included on Castle Hill on the first issue OS map of the area, dated 1841. 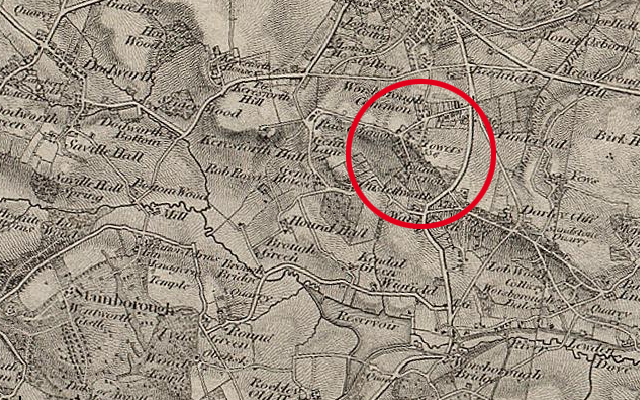 The 1841 First Issue Ordnance Survey map of Worsbrough. I was delighted to hear from a local source that two of the towers still survive in Kingwell Woods. In fact there is a local tale that the woods are haunted by a Blue Lady dating from the Civil War, who died by falling down and abandoned mine shaft or tunnel in the area. It didn’t take me long before I went to have a look. Kingwell Woods is a forlorn place. A narrow strip of land on a steep bank between Elmhirst Farm and Kingwell Road, it feels like a forgotten corner of Barnsley. One of the towers is easy to find, perched high on the bank, surrounded by thick woodland, it can be seen from the road once you know where to look. It is in a sad state, perched partly on natural rock outcrops, it still has bits of walling adjoining it and the remains of stone steps leading up the steep bank. Looking like it is used as a drinking den, empty cans and the remains of a fire litter the interior. 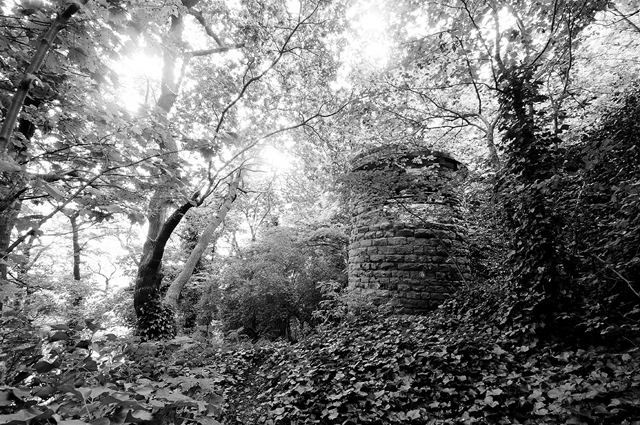 One of the lost towers in Kingwell Wood. The second tower is proving a bit more elusive. I headed down into the woods, but after a couple of hundred yards wading through tangles of brambles and ivy while carrying a heavy tripod, I turned back before I met the same fate as the Blue Lady. There were scatters of what could be drystone rubble, but nothing identifiable (there was a pinfold in this area that may also add to the confusion). The woods are so densely overgrown that I may have walked right past it. So that is another adventure for another day. 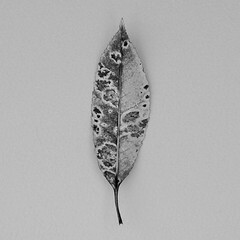 Probably once some vegetation has died back in the winter and without heavy camera gear. Another view of the tower in Kingwell Wood. How did these towers come to be on a hillside in Barnsley? There was certainly no castle here throughout the medieval period and the construction is definitely not in the same fashion as medieval fortifications. The answer lies in an 18th century local family feud that came to rest on the hill on the opposite side of Dove Valley, known now as Wentworth Castle. When the second Earl of Strafford died childless in 1695, Thomas Wentworth (1672-1739) expected to inherit the estate at Wentworth Woodhouse. However, the estate was unexpectedly passed to his cousin, Thomas Watson. In 1708, he purchased the estate of Stainborough Hall from the Cutler family and began creating an estate to rival that at Wentworth Woodhouse, changing the name to Stainborough Castle. A new Barque wing was completed in 1715 and in 1731, Thomas completed a mock castle behind the house on the hill top that was the site of the previously mentioned hillfort. He then changed the name to Wentworth Castle. William Wentworth (1722-1791) succeeded his father in 1739 and inherited his father’s appetite for building, adding another wing to the house. The 18th century was a period with a taste for follies, usually along classical lines, they were almost always of a romantic nature. Wentworth Castle certainly has classical follies, but there was another agenda at play here. The Wentworths were engaged in a show of one-upmanship with their relatives at Wentworth Woodhouse and what better way to promote your estate from that of a country house, than to declare it a castle of ancient origin. The estate was much larger than it is today and included the hillside of Worsbrough Common, which is clearly visible from Wentworth and a line of castellations would have looked magnificent from the grounds of the house (especially with the sun rising above them). Along with the folly on top of the hill at Stainborough Castle, it would also have given the landscape a feeling of ancient continuity. View of Wentworth Castle from Worsbrough Common. So what date could we attach to the building of the towers on Worsbrough Common? The 1817 Enclosure Act for Worsbrough Common gives us the following information. This seems to confirm that the towers were certainly the work of either Thomas Wentworth or his son William. If built by Thomas, they could have been constructed at the same time as the Stainborough Castle folly, around 1731. 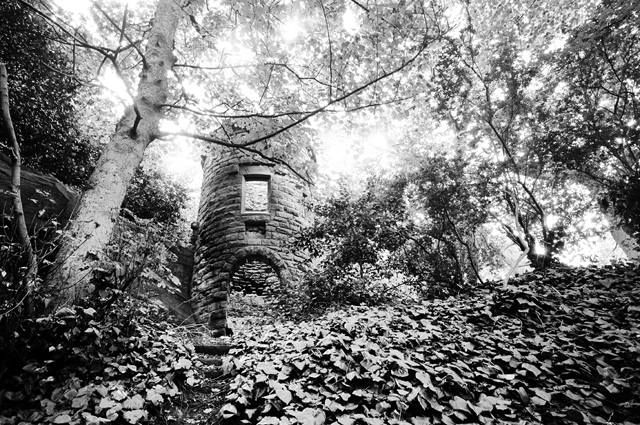 The tower in Kingwell Woods is similar in appearance to those that rise above the folly entrance. Stainborough Castle folly, before two of the towers fell in a storm. Another clue could be the date carved into Black Rock. It is said that the Earl of Strafford thought that the rock was hollow and intended to convert it into a summer house. This would explain the three arched doorways carved into the rock face. That date carved above the central arch is 1756, which places it firmly in the time of William Wentworth. William certainly had a taste for building follies and built the Corinthian Temple and Rotunda, which stand in the current parkland around Wentworth Castle, Archer’s Gate, Strafford Gate, Serpentine Bridge, the Obelisk at Birdwell and possibly the now lost pyramid at Blacker Hill, known as the Smoothing Iron. The likely conclusion is that the Worsbrough Common towers were constructed at some time between 1731 and 1756. 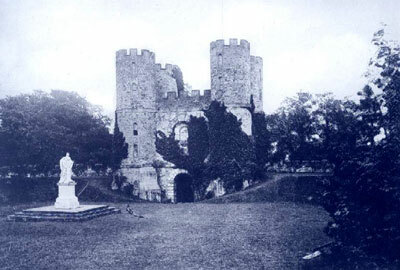 It is possible that they are contemporary with Stainborough Castle folly, but given William’s passion for folly building and that he was responsible for the masonry work on Black Rock, this could well point to him also being the builder of the Worsbrough Common towers. It is a great shame that what remains of the towers that once dominated the Worsbrough skyline are now forgotten and in such a state of disrepair. Especially given that Wentworth Castle park has been so spectacularly restored of late. Perhaps a little bit of care and attention is over-due for this little piece of Barnsley heritage. Worsbrough: Its Historical Associations and Rural Attractions. Joseph Wilkinson (1872).